Garlic & Potato Soup One of my all-time favorite foods is mashed potatoes. I could eat them every day, but this soup is even better. It's basically mashed potatoes in soup form, with the added bonus of roasted garlic. I also love roasted garlic; some people consider it the candy of the vegetable world. I wouldn't take it that far, but it sure is delicious. 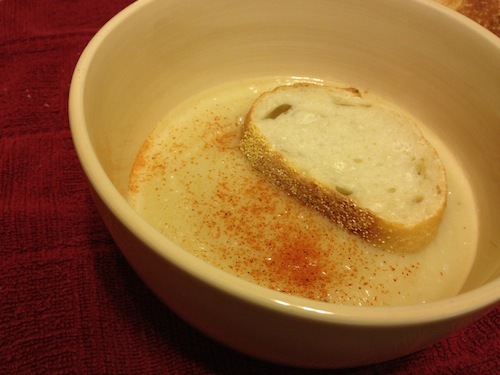 It adds a slight sweetness to the soup and adds to the velvety texture. Vegans and vegetarians can enjoy it, too, since you can use either vegetable or chicken stock. It couldn't be easier, and it couldn't taste more delicious! 1. Heat oven to 400F. 2. Peel and dice the potatoes. Toss with 2T oil, thyme, 2 tsp salt, and pepper. Place on a greased, foil-lined baking sheet. 3. Trim the tops of the garlic heads and place on some foil. Drizzle 1T oil on the garlic and wrap to close the foil. Place on the tray with the potatoes. 4. Bake the garlic and potatoes for 15 minutes. Stir to flip, then bake for another 15 minutes or until the potatoes are tender. Remove the potatoes and continue roasting the garlic until tender and golden. 5. Heat the remaining oil in a large pot over medium heat. Add the shallots and cook, stirring, for 3 minutes. Add the potatoes, then squeeze in the garlic cloves. 6. Mash slightly, then add the stock. Bring to a boil, reduce to a simmer, and simmer, uncovered, for 5 minutes. 7. Puree the soup in a blender until smooth. Add more stock if necessary.